Tumbling effectively engages the abdominal muscles. Looking for an exhilarating way to tighten your stomach that doesn't involve lying on the floor in a crunch position? Tumbling exercises demand an engaged core to ensure proper form. The results are firm stomach muscles with nary a sit-up in sight. Consult a gymnastics expert for safety tips and advice on proper form. Find a large, open space with mats for safety and relive some of your childhood tumbling memories. The affect on your attitude will also be inevitable as you bounce, twist and flip your way to firmer abs. The muscles in your stomach are often referred to as the core because they support your torso and spine, forming the foundation for all movement in your upper and lower body. Strong core muscles are vital for stability, balance and flexibility. 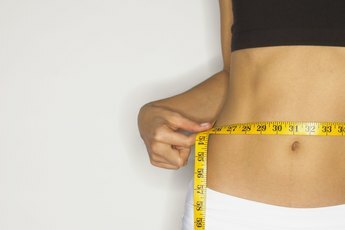 Major stomach muscles include the rectus abdominis, running vertically from under your ribs to your pelvis, the internal and external oblique muscles that form the sides of your abdomen, and the transversus abdominis, which runs deep within your stomach, keeping your organs in place. The forward roll to standing, also known as a somersault, makes use of your abdominal muscles when you spring up to a standing position after a completed roll. Learn how to successfully complete a forward roll before returning to a standing position at the end. Begin in a squatting position with your hands touching the floor for support. Pull your abs in toward your belly button and tuck your chin under as you roll onto your head and back to complete a roll. Spring up to a standing position using the momentum from the roll. Add speed by beginning in a standing position, then transitioning to a squat, and then a roll, making it easier to come back to a standing position. 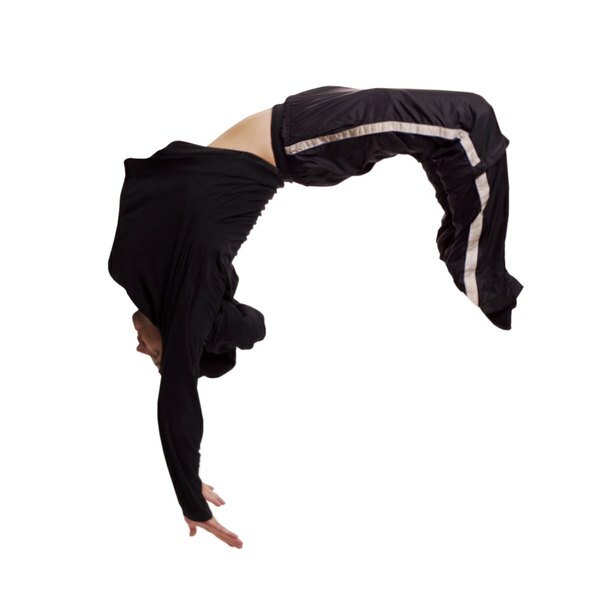 Gymnasts use the hollow position as a starting point for other tumbling exercises, like handstands, headstands, cartwheels or handsprings. The basic hollow position allows you to strengthen your abdominal muscles enough to perform well. Assume the hollow position by lying flat on your back with your abs fully engaged, lifting your arms up next to your ears and your legs extended off the floor. Hold the position for several deep breaths and release. Gradually build to a full hollow position by lifting the arms and legs 1 or 2 inches off the floor, aiming to create a V-shape with your body. Once you have perfected the hollow position, you can increase the difficulty by performing hollow rocks by rocking back and forth in the hollow position. The candlestick position engages your stomach muscles by requiring you to push your body into a straight line from a prone position. To perform a candlestick, lie on your back on a mat with your arms at your sides, palms facing down. Bring your knees to your chest and slowly lift your hips off the mat. Extend your legs up toward the ceiling, allowing your entire back to lift off the floor. Support yourself with your shoulders and arms as you tighten your stomach, keeping your legs straight above you. If desired, keep reaching your toes behind you until they touch the floor and then bring them back to the candlestick position. Hold the position for about 10 breaths. How Much to Bend the Knees Doing Sit Ups? How Can I Strengthen My Abs for Yoga Inversions?